It is now more a part of our collective imagination than our infrastructure. Known as the Mother Highway, the Will Rogers Highway, and Main Street of America, Route 66 was at one time a major artery across the country, the primary way to get from Chicago to California in the mid-20th century.Replaced by more modern thoroughfares by the 1970's, it will never be obsolete in America's folklore, living in songs, literature, and a television series nostalgia buffs can still purchase on DVDs. 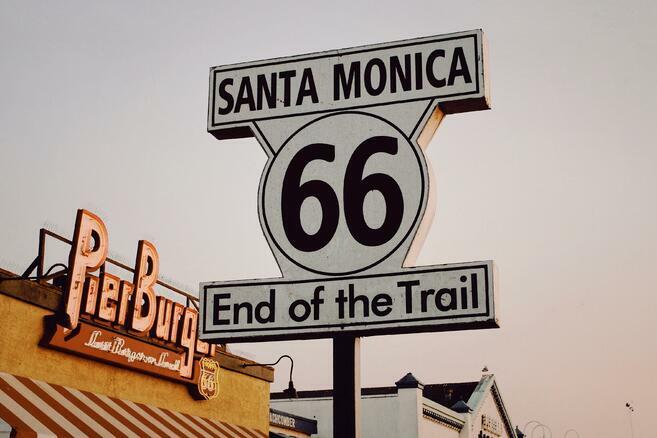 Travel along Route 66 and you will find the majestic Grand Canyon, the ever-contemporary Santa Monica Pier, and the whimsical World’s Largest Catsup Bottle. Even our own eCivis corporate headquarters in Pasadena is only walking distance away. Beyond the novelty and sentimentality, the Mother Highway has been demonstrated to bring a mother load of financial rewards to cities and towns along her route. Grants from the National Park Service's Route 66 Corridor Preservation Project can not only ensure that parts of this highway will remain unique living history, but that the communities on her path get the economic boosts they deserve. 85% of travelers along the road will stop at tourist attractions, putting $38 million into local economies. Historic preservation projects such as Main Street revitalization programs contribute another $94 million a year in investments. Annually, Route 66 generates 2,400 jobs, $90 million in income, $127 million in gross domestic product and $37 million in tax revenues. Were in service during the years between 1926 and 1985 and had a strong association with Route 66. Are on or within view of a Route 66 alignment. Are in their original location and retain their historic and architectural integrity. Examples of transportation-related properties include gas stations and other automotive-related businesses, restaurants, motels, hotels, campgrounds, tourist shops, original road pavement, and road structures. In addition, the project will also fund planning, research, and educational initiatives such as project planning, architectural drawings, historic structural drawings to be eligible to be listed on the National Register of Historic Places, planning and development of oral histories, research, and educational initiatives. Winslow, AZ, and the Arizona State Preservation Office - rehabilitated portions of the historic Rialto Theatre in downtown Winslow. Once a home to vaudeville, it has now re-opened for movies. American Indian Alaska Native Tourism Association - consulted with tribes along the route to compile first-voice perspectives of the highway which can be found on both the American Indians and Route 66 website and in the guidebook. Visitors can learn about Native history and general etiquette before their travels. Flagstaff, AZ - educates tourists and residents alike on the historical significance of the highway to the city with the Flagstaff Route 66 Rest Area Interpretive Project. Landmark Association of St. Louis - prepared a historic structure report for the Meramac River Bridge to determine how to preserve this endangered centerpiece of the Route 66 State Park. Vega, TX - restored the vintage Magnolia gas station turned barbershop turned interpretive stop along the historic portion of the route that runs through the city. Cinefemme - developed a website called Women on the Mother Road. Here the highway is itself a vehicle to tell the story of women whose lives intersected with the famous road in the broader context of the 20th century. Eligible applicants include Native American tribes and tribal organizations, state and local governments, nonprofits, academic institutions, and the private sector. Projects must be located along the Route 66 corridor in California, Arizona, Texas, Oklahoma, Kansas, New Mexico, Missouri, and Illinois. Matching is required. As evaluation criteria has changed for 2018, refer to the NOFA and FAQ for more information. The deadline is May 10, 2018. The National Environmental Education Foundation offers Every Day Capacity Building Grants to friends groups that serve public lands. The California Historic Route 66 Association was awarded a grant in 2017. The National Trust for Historic Preservation provides a variety of grants to its organizational Forum members and Main Street America members. The SummerLee Foundation provides funding to promote all facets of Texas history.